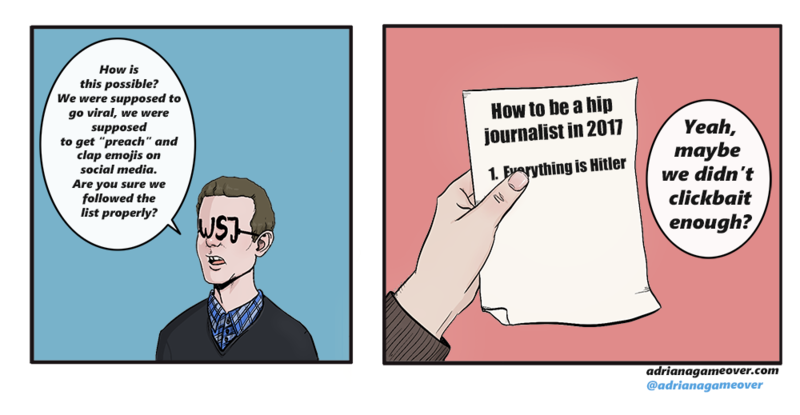 Although this one is about the Wall Street Journal and PewDiePie, you can apply this comic to a lot of the “journalism” we are seeing lately. Whether it’s merely for views, or an attack against new forms of media, it’s clear this is making various publications lose all credibility. It’s quite sad to see newspapers from both political sides becoming sensationalistic rubbish. I hope the WSJ learned that you can’t slander and attack someone’s livelihood unfairly without consequences. If the past few years have taught us anything, is that when you play inquisitor you eventually end up burned at the stake.